We manufacture different shapes of Shredding Knives including cubes, square, rectangular, and circular. 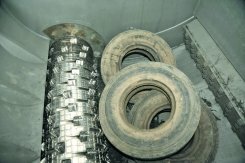 The shape and the material type is determined according to the application. The mostly used steel qualities are 1.2379, 1.2343 and 1.2767. In order to achieve the best technical solution we manufacture upon the customer's request also Shredding Knives from other materials. 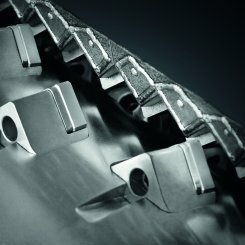 The design of our blades start in the design department, where current computer CAD programs are used to design final products and find optimum solutions to satisfy our customers specific needs � from geometric alterations through to material selections, which guarantee best results at high stresses. Our products are made of the highest quality tool and high speed steel, which we purchase at well-known European steel-works. Besides using proven steel such as 1.2379, 1.2360, 1.2345, 1.2367 and others, we also use powdered steel in our production process ie. ASP or K340, which enables our knives to achieve better lasting characteristics. 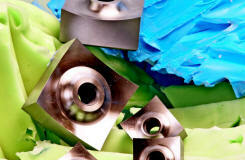 Knives for plastics, metal, wood and E-Waste are manufactured from finest high alloyed tool steels. Particular alloying elements in these steels are crucial for quality cut, high wear resistance and mechanical stress. Modern technology equipment for mechanical and heat treatment, in house R&D and decades of experience are the reason that our knives and blades are always manufactured within the required tolerances regarding dimensions and heat treatment. In addition to the standard tool steels we increasingly use innovative steel grades that are purchased only from the best European manufacturers of tool steels. 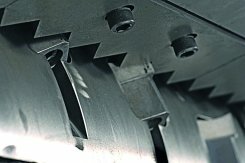 With many decades of in house experience designing and manufacturing granulators and blades you can be confident your machines are in good hands.